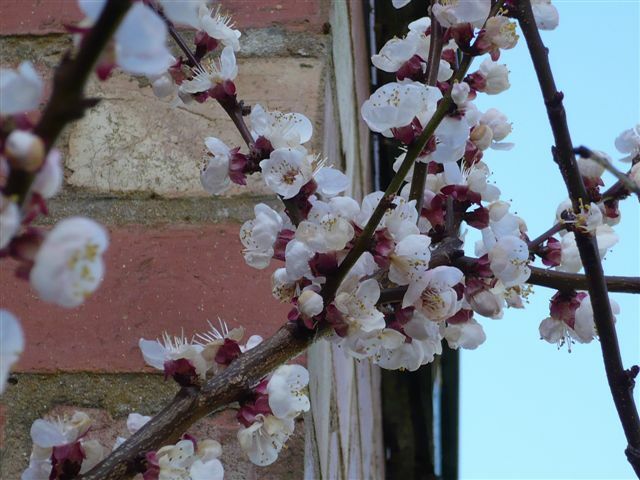 On our main web site Adrian Baggaley in his article ’Spring comes to an East Midlands orchard’ wrote of the damaging effects of a frost on apricot blossom, but in Leicestershire an apricot tree came through relatively unscathed. 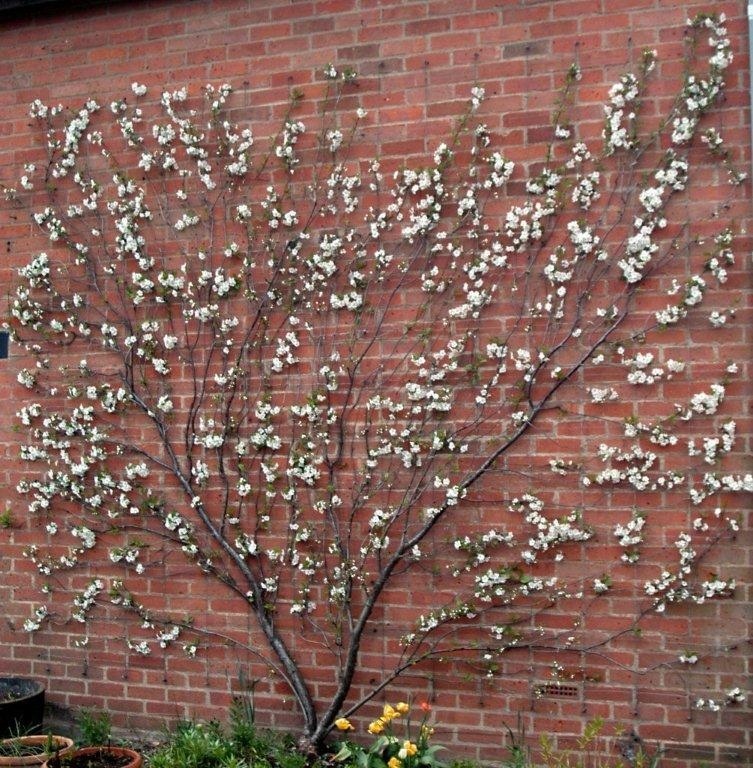 Apropos of Adrian’s comment about frost putting paid to apricot blossom, I doubt if the March frosts were materially less vicious here in Leicester than in Nottinghamshire, and much of the blossom on my apricot tree turned brown. Nevertheless, the tree now carries a reasonable crop of broad-bean sized fruitlets. It is on a wall facing due East and has no other protection. 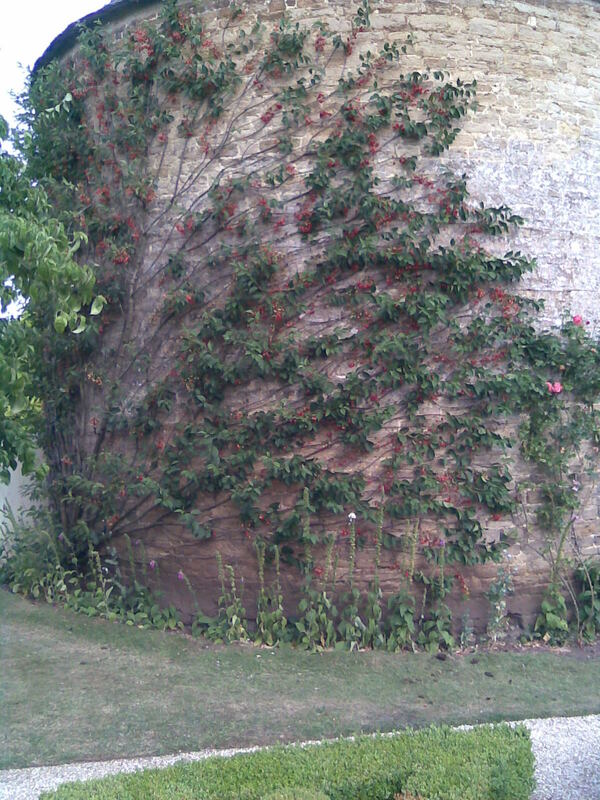 I supposed, when I saw the damage, there would be no crop at all and can only imagine we got away with it because the tree, which was grown from a stone, has a lengthy blossoming period. Cider Orchards – what sprays are being used now? Can anyone please tell me what the likely sprays are now being used in Cider Apple orchards. Even newly planted trees about 4ft. in height are being sprayed. The height of the spray exceeds the height of the tractor and on fully grown trees exceeds the height of the trees. We are close neighbours. This is a particularly dry Spring. Any bearing? The Most Beautiful Trained Morello Cherry? 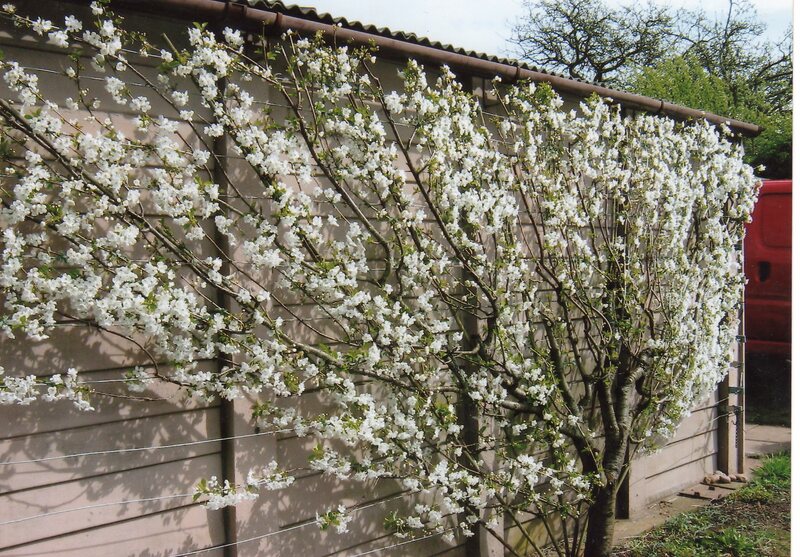 Can we have a competition to find the most beautifully trained morello cherry tree? It must be worth the trouble if it looks like the one on the ancient pigeon house in the walled garden at Rousham, near Oxford. This is my nomination for the best I have ever seen. Is this work of art not also easier to net against the birds?I would take up Edward Olleson on his view as to how sour a ripe morello can be, but I find them wonderfully refreshing on a warm July day! I provided a note on this outstanding blackberry for Fruit Forum perhaps a couple of years ago*. The only variety to grow: a prolific cropper with incomparable flavour, unlike those vaunted for their earliness, which have no taste at all – and who wants early blackberries anyway, at the same time as raspberries? Seasonal growing! But a badly behaved, viciously thorny brute. Unlike well-mannered hybrid berries, such as loganberries, producing a number of manageable shoots from the base each year, ‘Fantasia’ does not, instead throwing only two or three monsters, each of which then branches prodigiously. A menace for training, which rips you apart once every year. But worth it for the fruit. Never easy to find, it now seems to have disappeared from everyone’s list. It would be a shame if it were allowed to disappear from sale. Of the highest quality despite its bad habits, it tip-layers so readily that it must surely be a commercially viable proposition. Would any nursery please take it on? Meanwhile, between friends, I may be able to help with two or three. *See: ‘Buckingham Tayberry: problems with my plants’. 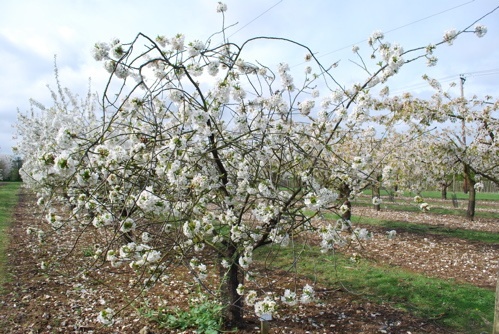 Fruit blossom is on the move and we will follow its advance through the National Fruit Collections, Brogdale, Kent, courtesy of Mary Pennell who has kindly agreed once again to give us a weekly update, but first her overview of the past few weeks. So far, everything seems to be at least two weeks earlier than last year and even 2 -3 days earlier than 2009.The apricots flowered during March and have now all gone over. Alfred was the earliest with its flowering starting on 13th March. Royale was the last to reach 90% petal fall on 30th March. The others obviously fell between these two dates. 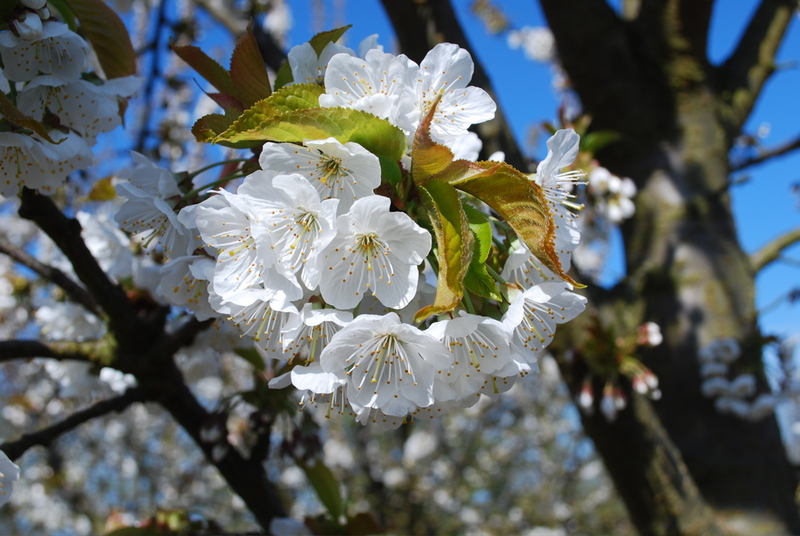 Most of the ornamental Prunus are in flower now and looking very attractive. The early plums have just started flowering and most others are at white bud. Cherries are also coming up to white bud. 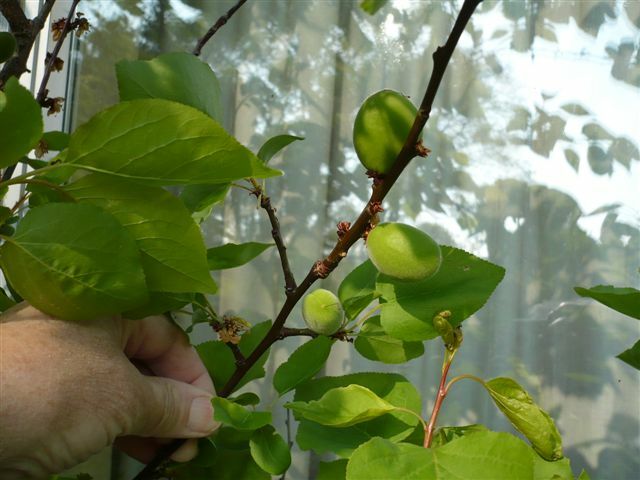 Most pears are at late green cluster compared to bud burst at this time last year. Apples are at mouse ear – green cluster compared to most only being at the bud burst stage this time last year. The cooler weather of last week has definitely slowed things down. The Orange Pippin web-site is recording blossom dates for apples around the country on its Apple Tree Register. Apple Crusher and Press – recommendations please? Is anyone able to recommend an apple crusher and press suitable for processing to juice relatively small quantities of apples? We have about 30 mature apple trees and would like to press the fruit in order to bottle or freeze the juice. We’d certainly be grateful for any recommendations!